Did you ever eat something so delicious that you make an excuse to eat it again? That’s what kind of happened with these pie cookies. 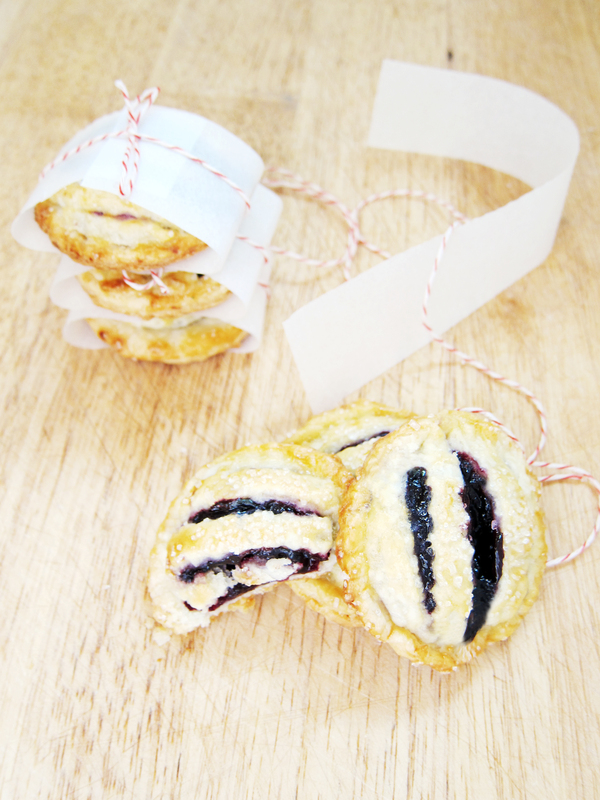 You see, I made these adorable pie pops for Pi Day and they rocked my socks. The only problem was they were too small. One bite and you were done. I can satisfy myself with eating only one slice of pie because frankly, it is a whole slice of pie. But pie pops? I sat there taste testing them one at a time, and before I knew it there was an embarrassing pile of lollipop sticks. Bigger dough = more filling = more delicious. 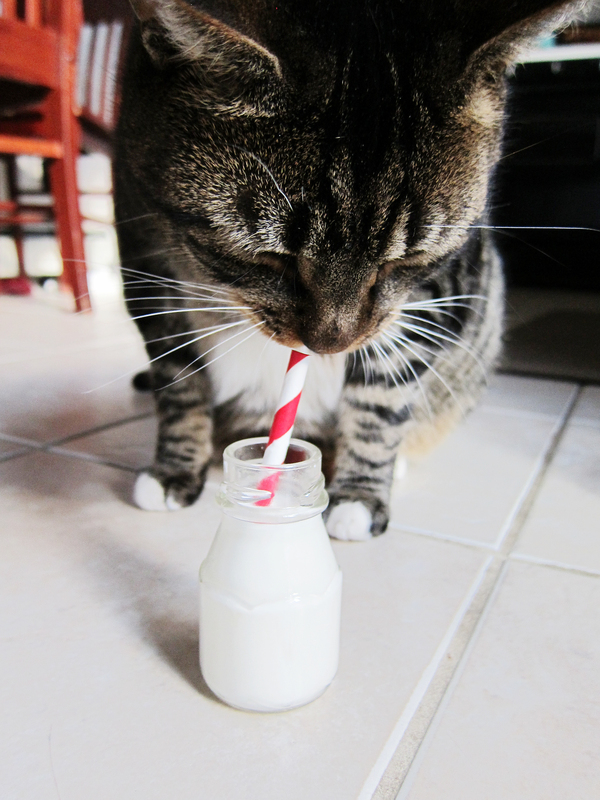 I realized that the cookies don’t look very small in the photo, so here is the milk glass with my cat, Bear, for a size reference. Yes. He is adorable. In a bowl of a food processor, pulse flour, sugar and salt together a few times to mix thoroughly. Add the butter into the food processor and pulse until butter becomes the size of peas (or smaller). Add the cold water and pulse until dough starts to come together. Divide the dough into 2 pieces and wrap with plastic wrap and refrigerate for at least an hour. 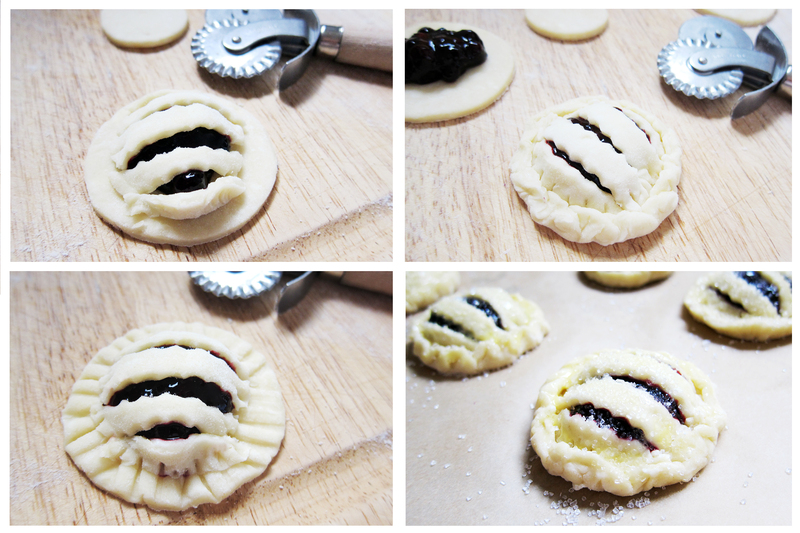 While the dough is chilling, make the blueberry filling. In a small pot, combine 1 cup of blueberries with ¼ cup of sugar. If the dough starts to become sticky or warm at any point, place into the freezer to firm up for 3-5 minutes before working on it again. This is very important, since the cold butter is what gives you the flaky layers. Take out half of the prepared pie dough and roll out until ¼- ⅛ inch thick on a floured surface. 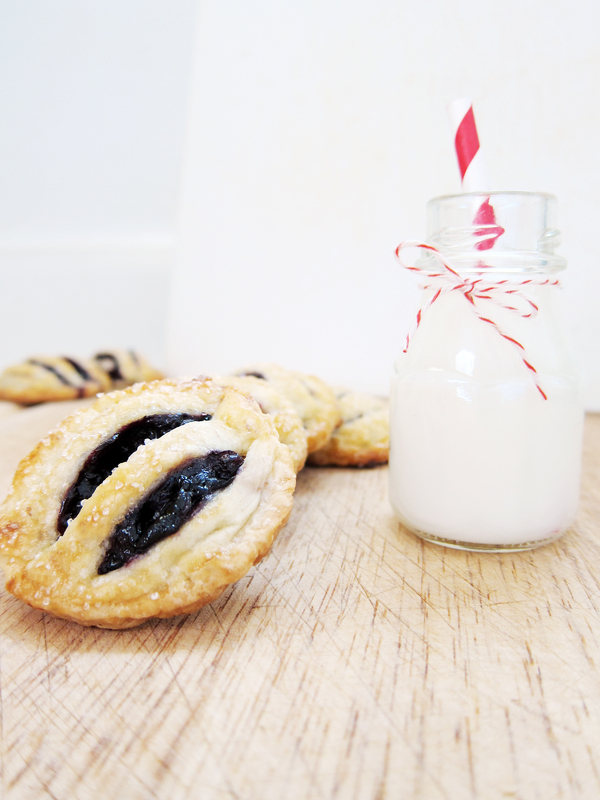 Cut out pie rounds with a 2 ½ inch round cookie cutter**. Reserve half of the pie rounds and cut the rest into 4 strips with a fluted pastry wheel or a pizza cutter (a knife will do too). Place into the freezer for 5 minutes to chill before baking. Bake at 350 degrees for 12-15 minutes until golden brown. While the first batch is chilling and baking, start working on the second batch with the other half of your prepared pastry dough. Cool for 5-10 minutes before consuming. * I used frozen wild Maine blueberries. They are a lot smaller than your average supermarket blueberries which make them ideal for this filling. If you can find them, use them instead of regular blueberries. They also taste more blueberry-y than regular blueberries (if that makes sense). ** If you cannot find a 2 ½ round cookie cutter or you do not own one, feel free to use a cut out can as your cookie cutter. It works similarly, except you might not get as clean of an edge when you cut out your dough. This entry was posted in Cookies, Desserts, Fruit, Pies. Bookmark the permalink. Great recipe. I really can’t cook or bake but your instructions were super easy to follow! 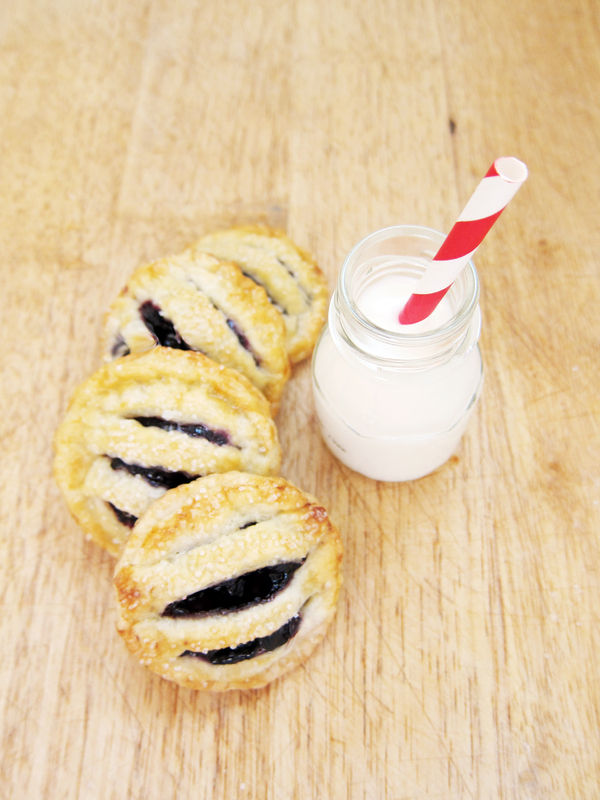 The mini pies were delicious and super cute!